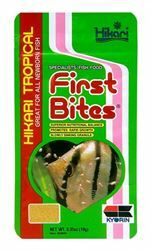 Great For All Types Of Fry (Newborn Fish) Provide any newborn fish the exacting nutritional balance they require dring the earliest developmental stages of their life. Rich in highly nutritious, freshly harvested ingredients including premium-selected fish meal which provides a superior protein source rich in amino acids. 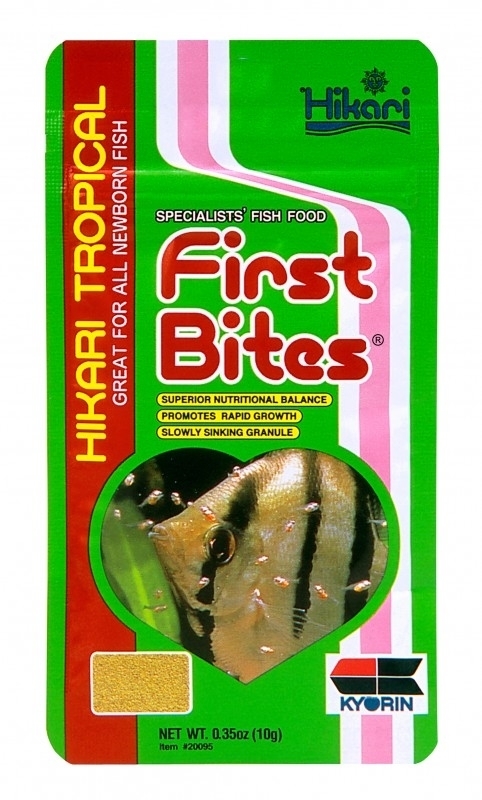 Hikari® Tropical First Bites® offer a uniquely balanced nutrient profile for the, all important, developmental stage of your fry's life and promotes proper feeding habits. This semi-floating food allows fry at all levels of the aquarium ready access to its exacting nutrition while reducing water quality issues common with other fry foods. For optimum results feed daily as often as possible the amount your fish will consume within 2 to 3 minutes. Care should be taken to avoid feeding larger quantities of food less often as it can cause a lack of nutrition. For best results feed up to four times daily an amount of food which can be consumed within a minute. Soak in a cup of aquarium water before feeding. This will cause the food to sink more rapidly providing these fry ready access to the nutrition. They can consume Hikari First Bites right after birth. They utilize their yolk sack for nutrition right after birth. Start feeding Hikari First Bites right before their yolk sack is fully consumed.